This is a segment that appeared on Hooked and Fish & Hunt Australia last season – I cooked a blackfish caught by Dave Butfield using a store-bought Malaysian curry paste; the idea being that if you’re out fishing and camping, you probably don’t want to lug around huge amounts of fresh ingredients and utensils nor spend too much time prepping your meal. 1. Drench the fish with some cornflour or tapioca flour. 2. Heat oil in frying pan and pan-fry fish until cooked through. 3. Combine the curry paste with all the other sauce ingredients and heat through. 4. Pour over fish and serve. The other reason I’m sharing now is because I’ll be filming more episodes for Season 8 of Fish and Hunt Australia (aka Hooked in past seasons depending on the network it airs on) and this time around I’ll be in 5 segments so keep an eye out for me on Foxtel. Here’s a pic of me with Dave and his new co-presenter NRL player Beau Scott (tell me I’m not the only person whose first response when told the news was “Beau who?” – there’s got to be dozens of us out there who don’t follow the NRL, right?). Dave and Beau do make a great team so I’m excited to be part of the show. 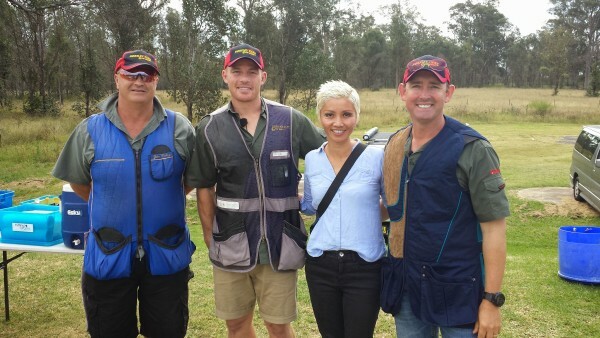 Cast of Fish and Hunt Australia including NRL player Beau Scott and Dave Butfield.